Say Hello to Hey Jude! PLUS WIN a Voucher! OK lovelies! 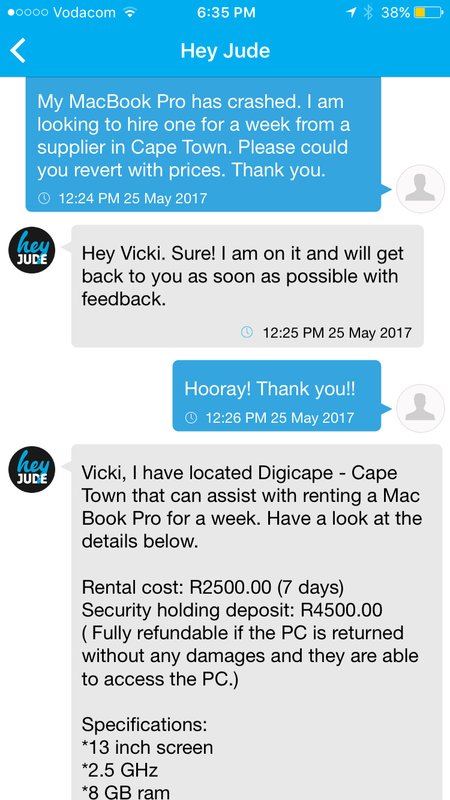 Today i want to tell you about Hey Jude – the new virtual assistant app that may seriously my new best friend. I don’t know about you but my to do list of freaking admin and things I need to get done and the information I need in order to get it done is never ending!!! Every day I write out my to do lists, it’s a ritual I’ve always enjoyed but seriously, the volume is just getting me down. And it’s not all stuff I resent sorting (like insurance claims), some of my admin involves stuff I actually want to sort in order to have fun! Like restaurant bookings, inviting friends round and weekends away and the like. I didn’t even get round to holding a class birthday party for Charley for her 3rd birthday party because…useless. 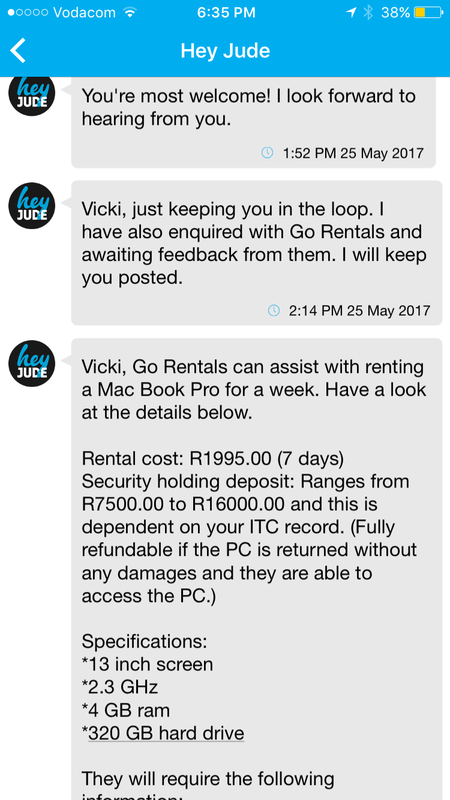 So a couple of weeks ago, the folks at HeyJude asked me to test drive their app. I had heard about it over on a small business Facebook page I belong to and I’d heard bits and bobs about it on other pages but I hadn’t yet had a proper look. And since a virtual assistant is something i’m really toying with at the moment, it turns out the timing couldn’t have been more relevant. They couldn’t have given me a more comprehensive answer to my issue! 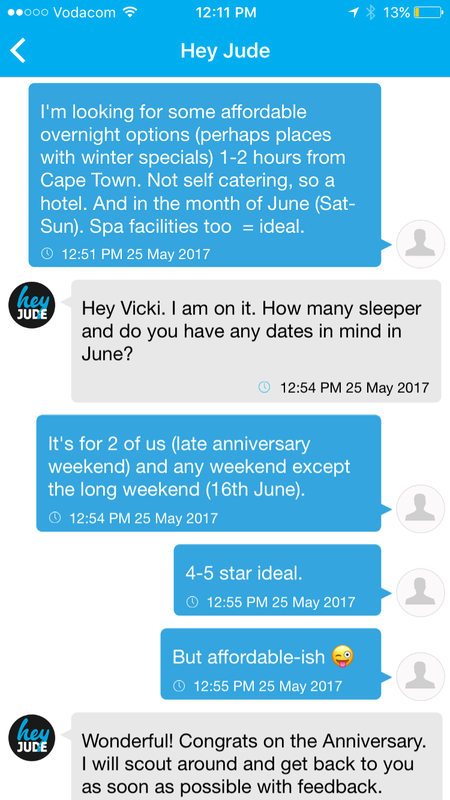 My second task for the Hey Jude task team was to sort out a night away for The Captain and I. I am so gatvol of this damn communication trifecta that I just want to run away! This year The Captain and I opted not to give one another gifts for our anniversary but rather have a night away together. One where there is room service and a spa. I could think of NOTHING better than running away somewhere closeish to town and hiding away from the world for an afternoon and an evening. Also, the thought of a full night’s sleep and only sharing my bed with The Captain and not my snoring 3-year-old and our often night owl baby sends me into an orbit of joy. • They work 24/7 baby, 365! They’re HUMANS!!! No, press 1 for assistance rubbish, actual humans, looking out for you! I know they’re mostly practical asks that I got there Jude’s onto but that’s where I am right now – I need practical solutions to the pressing mares happening around me. • Father’s Day Dim Sum lunch venues for this Sunday? I could go on forever people!! Hey Jude is dare i say it, the wife that many of us need. OK…Want to get onto the Hey Jude Bandwagon and WIN? • Tell us what YOU would use the Hey Jude app for in the comments below – it can be mundane, it could be a pressing must do on your bucket list – tell me what it is – your first three transactions are totally FREE!! Omw. .. I want this app… No I need it! I’d use it for definitely weekend getaways and what fun activities for kids to do over weekends because with the cold Cape Town weather… having an active 4 yr old indoors, literally drives me insane. WOw awesome app!!!! 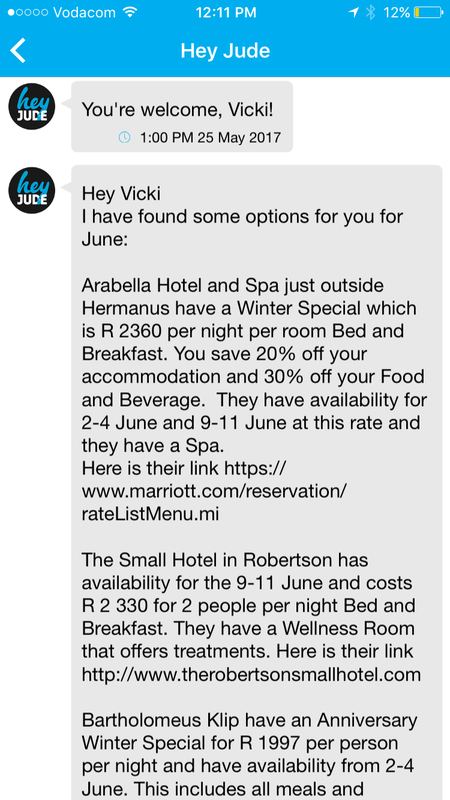 I have friends coming over from the UK in August so I would definitely use this app to find accommodation for myself to go and visit them in Cape Town, plus check on air fares and on things to do in and around Cape Town whilst I am with them. I would use the phenomenal app to locate a reasonably priced handyman to do household repairs that my late husband did for years – I only now fully appreciate the full extent of his assistance! This is awesome! Im saying hello to @Hey JudeApp right now! I would use it so thhey can help me to plan a family camping trip, with lots of activities for family bonding. 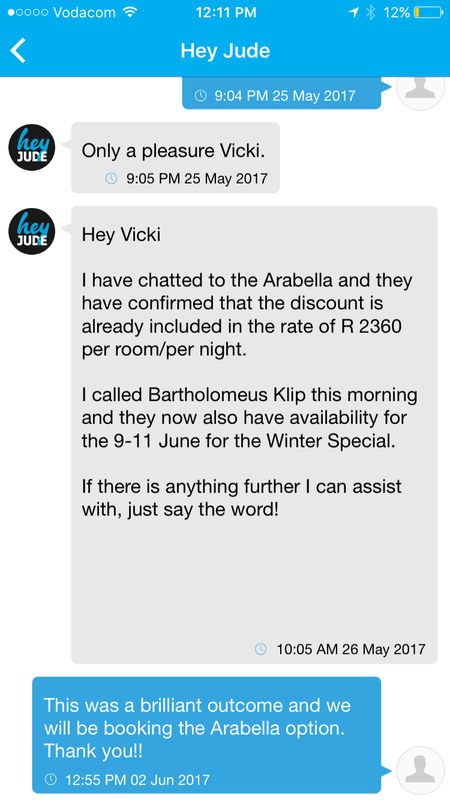 I would use Hey Jude to find out about places to take the kids to over weekends! 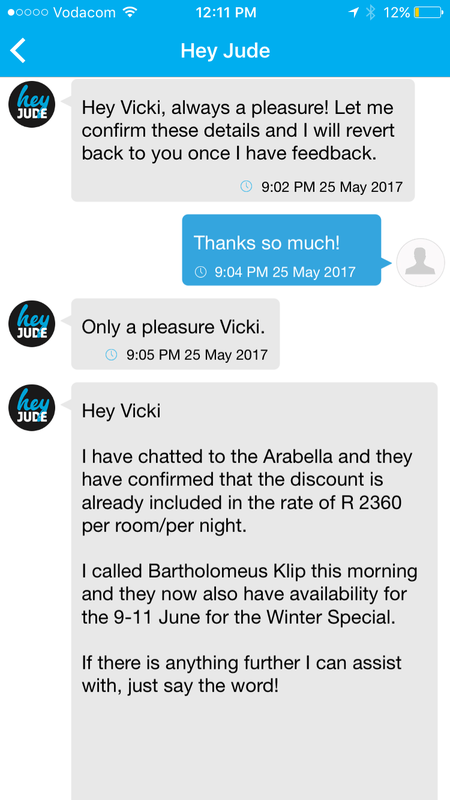 I will use Hey Jude for corporate functions venues which always seems like a nightmare to find – kids party venues – what to do with busy boys in winter (other than rush and be up) and some new and interesting hikes and trail running spots with getaway places! I definitely can think of so much Hey Jude can assist with. Awesome App !! 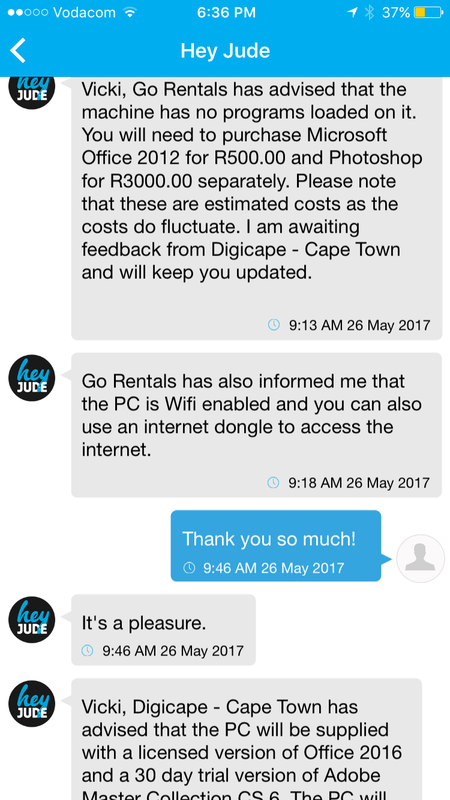 I recently test drove HeyJude with a plumbing request. Asked for a geyser quote and got two call out quotes of their prefereed suppliers. My Jude made an appointment and followed up to check if the plumber arrived. We now proud owners of a brand spanking new geyser fitted by a expert plumber. No calls no numerous call outs. In love with this app! Hey Jude will you go and sort out my car license for me? 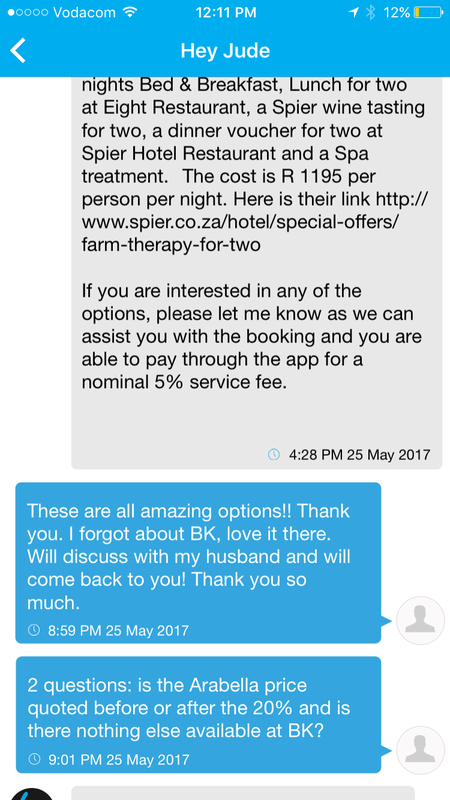 I would use the Hey Jude to compare holiday packages to Mozambique and to compare script medication prices! What an awesome app. I would ask Hey Jude to find me find the best seats at the most affordable price to take my family to see Disney on Ice.. Something that has been on the bucket list for 3 years running but just hasn’t materialized yet. I would get Hey Jude to help me get everything I need for a new baby, basically to get baby ready, get the perfect decor for my eldest daughter’s sweet sixteen and they perfect gift for her too. 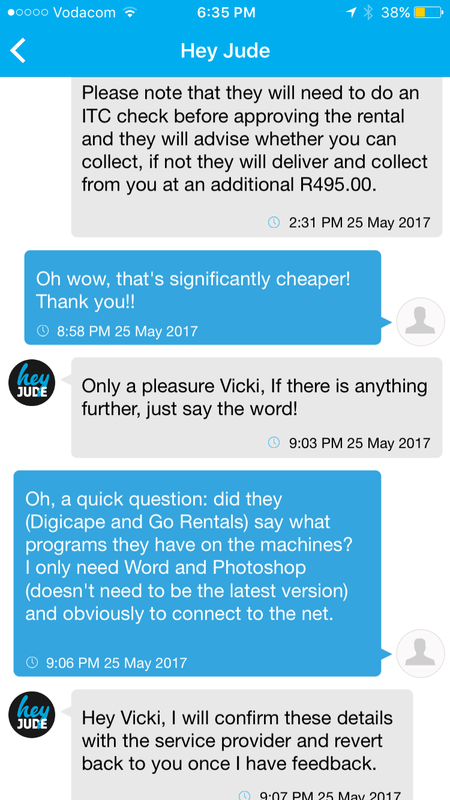 Hey Jude sounds amazing – i would get them to help me find a handyman in my area – like to support local! This is an awesome app. I would use this app for my regular breakfast dates with the ladies. We always looking for new restaurants and coffee shops to explore. I just found a new best friend​, definitely share this with the ladies. I need a vintage / used clothing store to sell a consignment of designer clothing. As the proceeds will go to an animal charity, I want the best deal possible. Please help! What a fantastic idea!! I would use this amazing app to find vegetarian cafes and restaurants when I travel locally in SA. It’s such a pain getting to a new place, tired and hungry and wondering where to find healthy vegetarian restaurants or cafes. Instead of resorting to nuts and berries, I’d simply call on Hey Jude! 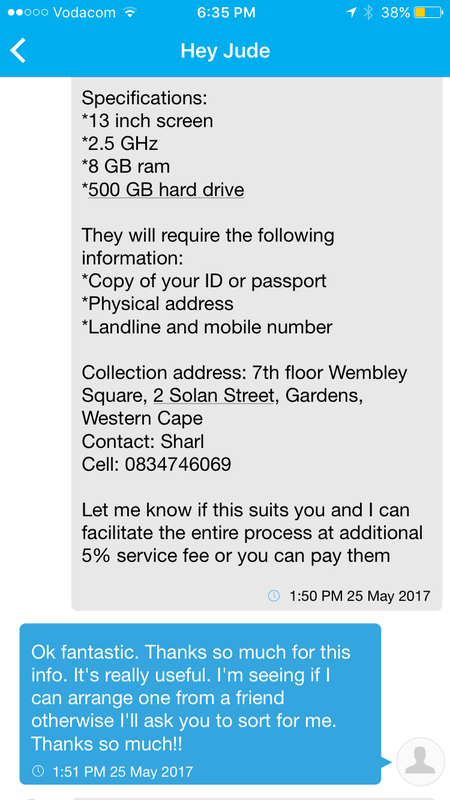 I’d ask the Judes to help me find the best student budget lunch specials in Cape Town. Would love to explore more of the hidden gems in the city! I’d use it to find the perfect place for a weekend getaway for my wife & I. Life has been hectic lately & we need some time together just to reconnect. It doesn’t have to be far from home. I’m thinking of the Midlands! I would use it to help find a reliable and affordable handyman cos being single has it’s downside to certain things around the house..
OMW, this is amazing!! I love treating myself to Spa experiences. I’d use #HeyJude to find me the best specials so that I could save money. That way, the transactions would more than pay for themselves!